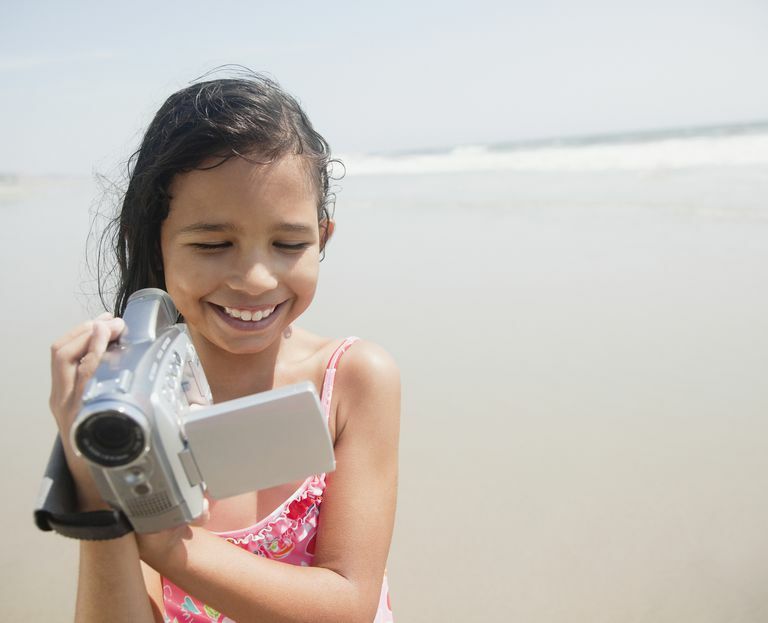 Digital camcorders record video to a variety of memory formats: Digital 8, Mini DV, DVD discs, hard disk drives (HDD), flash memory cards and Blu-ray Discs. Each camcorder memory format has its strength and weakness. It’s important to familiarize yourself with the various camcorder memory formats because the type of memory a camcorder records to will have a major impact on its size, battery life, and ease-of-use. Note: this article only covers digital camcorder memory formats. If by chance you're interested in analog technology, please see Analog Camcorder Basics. There are two primary digital tape formats: Digital 8 and Mini DV. Digital 8 is an 8mm style tape used only by Sony. Mini DV records video to small cassettes. While you’ll find both formats on the market, camcorder manufacturers are steadily reducing the number of tape-based camcorders they sell. While tape-based camcorders are less expensive than their rivals, they’re not as convenient, at least where transferring video to a computer is concerned. Moving digital video from a tape-based camcorder to a computer is done in real time – an hour of footage takes an hour to transfer. Other formats such as HDD or flash memory, transfer video significantly faster. If you’re less concerned with storing and editing video on a computer, tape formats still provide a high quality, low cost digital option. DVD camcorders record digital video onto a small DVD. DVD camcorders typically record video in the MPEG-2 format and can be played back in a DVD player immediately after recording. DVD camcorders are good for consumers who want to be able to instantly watch their video after recording and are not interested in editing the video. Blank DVDs are also fairly inexpensive and easy to find. DVD camcorders do have limitations. Because the disc is constantly spinning, the camcorder battery will drain quicker. If you jostle the disc while it’s in motion, you could disrupt your recording. If you opt for a high definition DVD camcorder, you’ll have a very limited recording time, particularly at higher quality levels. DVD camcorders are also fairly bulky. Hard disk drive camcorders record video directly onto an internal hard drive on your camcorder. HDD camcorders have the highest capacity of any storage format available – meaning you can fit hours upon hours of video on the drive without having to transfer it to a computer. Items on a hard disk drive camcorder can be deleted and moved around within the camcorder allowing camcorder users the ability to easily organize their video. While hard drive camcorders can store hours of footage, they also have moving parts. This means the battery will drain quicker and jostling of the device can potentially disrupt recording. The same flash memory cards used in digital cameras are now being used to store digital video. The two most popular formats are Memory Stick (used exclusively by Sony) and SD/SDHC cards, used by the majority of camcorder manufacturers. For more information on SD/SDHC cards, see this Guide to SD/SDHC Camcorder Flash Memory Cards. Flash memory cards have several advantages over other camcorder formats. They’re small, so flash memory camcorders can be significantly smaller and lighter than their competitors. Flash memory has no moving parts, so there’s less drain on the battery and no concern about disrupted video due to excessive jostling. It’s not all upside, however. Flash memory cards can’t store as much video as an HDD. If you’re going on an extended vacation, you’ll have to pack an extra card or two. And high capacity memory cards aren’t cheap. Many camcorder manufacturers offer models with built-in flash memory. See Guide to Flash Camcorders for more. To date, only one manufacturer (Hitachi) offers camcorders that record directly to high definition Blu-ray disc. The advantage here is similar to DVD – you can do your filming and then drop the disc directly into a Blu-ray disc player for HD playback. Blu-ray discs can store more video than a DVD, however, they’re susceptible to the other drawbacks of DVD: moving parts and a bulkier design. While predicting the future of digital technology is nearly impossible, it's safe to say that for the immediate future, consumers are clearly leaning towards HDD and flash memory as their preferred formats. Responding to this demand, camcorder manufacturers are steadily reducing the number of tape and DVD-based models. What Memory Card Should You Use in Your Camcorder?